There is a philosophy having the name Advaita and there is also a philosophy called Dvaita. Both these terms- Advaita, Dvaita- are found in scriptures, including the Upanishads. Now, there is yet another philosophy having the name "Vishishtadvaita". So, is this term too a scriptural one? Are there any instances where the word is used in any of the scriptures? Since, the philosophy was propounded by the Vaishnavas and is followed too by the Vaishnavas, so we can assume that at least some Vaishnava scriptures might be making mentions of the word. Presumably by 'scripture', you're referring to one of the ancient texts belonging to one of Shruti, Smriti, Itihasa, Purana and not the works of recent Acharyas. If that is the case, the term 'visistadvaita' cannot be found in the scriptures and it is a relatively modern (post-Ramanuja) invention. Ramanuja himself is not known to have used the term in any of his 9 works including the Sribhashya and the Vedartha Sangraha. Vaduga Nambi was a disciple of Ramanuja, hence a contemporary although it is quite likely he composed the verse sometime after Ramanuja passed away.. The term was invented in order to comply with the rules of prosody when composing this verse. The technically correct term that describes Ramanuja's philosophy would be "saviśeṣādvaita" or "non duality (advaita) with differences". 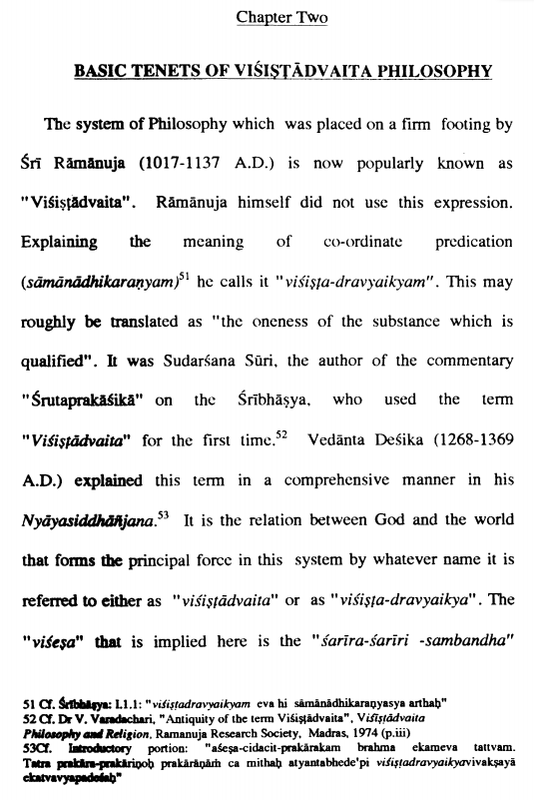 The term Visistadvaita ended up becoming more popular although when discussing the theoretical issues in orthodox circles, saviśeṣādvaita is frequently used as well. Not the answer you're looking for? Browse other questions tagged scripture philosophy identification-request vishishtadvaita .